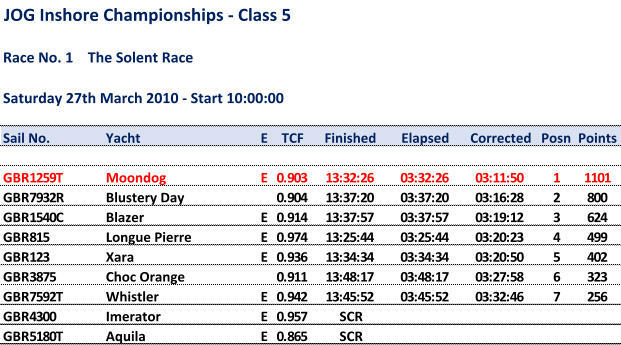 Started the first race off with a bit of brinkmanship by being too far down tide of the start and running out of diesel. Panic re-fuelling and a couple of attempts at bleeding the fuel line and just made it close enough to the line by the five minute gun. Crept over the start line and tacked on the gun for what turned out to be a pretty good start as we lead the fleet down the first beat to Salt Mead. Quick hop across the Solent to West Lepe and another long beat to Lymington Bank. Lost out to Longue Pierre and Whistler but kept ahead of the rest of the fleet before getting onto the down wind leg to Hamstead Ledge. As the tide was still against we kept into the Island side with multiple jibes as we kept outside the 3m line. A slightly reverse hop across to Solent Bank and decided to see how many fag papers we could get between the boat and the buoy which turned out to be not that many. Down wind all the way to the finish with a loop inside Salt Mead and got back into second so lots of speculation on how much Longue Pierre needed to be ahead of us to get us on handicap. As it turned out we had 9 minutes on her so with all the rest of the fleet, who rated higher than us, behind us on the water a good win.